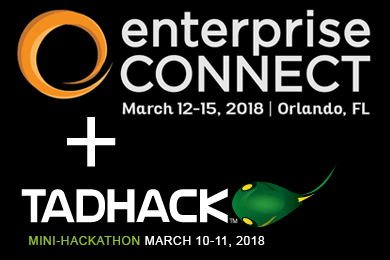 We plan to stream TADHack-mini Orlando 2018 live over the weekend for anyone who’s interested. You may be hacking remotely, but you can still feel like you’re working at the Collaborative Design Center at Valencia College in Orlando. Or if you are traveling over the weekend to Orlando to attend Enterprise Connect 2018, you can see people using programmable telecoms to solve problems that matter to them live! Day 1, Saturday 10th March, will capture people arriving, the sponsors’ presentations and everyone beavering away, learning the resources, and working out how to create the minimum viable hack to demonstrate their idea. Pitches. We’ll have a separate stream for the Pitches, this is were things get intense. And most people tune in to see what’s going on. We keep this as a separate stream so its easier to search. We will have all the videos edited individually by Tuesday 13th March, if not the Monday. If you do not see the live videos on this weblog, sometimes we have to restart a live stream so the URL changes, just head on over to the TADHack YouTube channel to see what’s being streamed. Thanks. VoIP Innovations – voice, messaging and video APIs/SDK, plus the opportunity to sell your hack/service to their customers! Turn your hack into a business. Telnyx – calling, messaging and phone numbers through an API built by developers for developers. Flowroute – Integrate calling and messaging (SMS & MMS) into any app or service via the Flowroute APIs/SDKs. Avaya / Zang.io – seamlessly integrate communications actions, such as voice and messaging, into any application.